LONDON, 8 OCTOBER 2018: Walstead, Europe’s largest independent commercial printing group and parent company of Wyndeham UK, appeared for the first time at number 35 in the Top Track 250 league table, published in The Sunday Times on 7 October 2018. The report ranks Britain’s top-performing privately-owned mid-market growth companies as measured by revenue. Walstead’s entry was based on its 2017 audited accounts which showed revenue of £421.6 million. In the separate revenue growth league table, Walstead was ranked at number 2 with a year-on-year revenue increase of 102%. 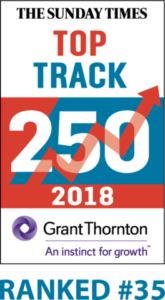 Fast Track is the UK’s leading research and face-to-face networking events company, which ranks top-performing private companies and entrepreneurs. Fast Track has compiled league tables on private companies in partnership with The Sunday Times for the last 21 years. Note: Walstead reports in Euro. The forecast revenues referred to above are based on a GBP:Euro conversion rate of 1:1.12.